Let the $100 profit trolling comments start. Based largely upon the existing costs of components used in the iPad 2, Nexus 7 and Kindle Fire it’s reckoned the iPad mini may cost $189.32 to build there are however some missing costs in these figures. Whislt the figures worked out by tech-thoughts.net do make some sense, using logic and lets say a little bit of faith there are some missing elements. 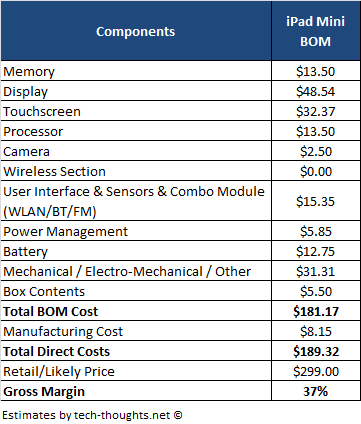 If you look purely at the Bill of Materials (BOM) then yes, thats a lot. however what about the R&D cost per item, cost of shipping each unit, build into that overall figure returns, shipping returns and all those little other things that nip into your bottom line. I should know after running my own PC retailer for a good number of years. With the Nexus 7 getting solid reviews and general all around praise is this Apple’s first reaction to the market rather than carving out their own niche? Next Next post: YouView to Get LoveFilm Love Soon?